I do the majority of my backpacking solo. And while I am perfectly confident in my skill and common sense for avoiding (or dealing with) an emergency situation, my wife prefers to know that I’m safe when I’m "Out There". So, a few years ago, I invested in a Spot 2 GPS Messenger. 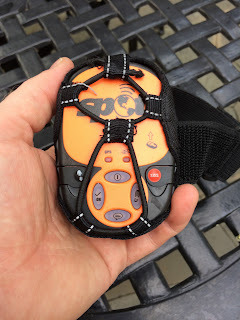 It is a nifty little device about the size of your palm, that you can attach to your pack or strap to your arm, which you can use to send pre-recorded text or email messages via satellite to a list of recipients. It is a pretty simple setup - it has a power button, two routine message buttons, an automated tracking button, and two emergency message buttons (Help and SOS). There are also two blinking status lights. When you power the unit on, the power button blinks to let you know that it is working. If you want to send one of the two pre-recorded messages, you can press either the Check-in/OK button or the Custom button. This will cause the button to blink along with the satellite status light; and once the message goes through the email status light with blink green. If the message fails to go through after 20 minutes of trying, then it will show a red light, and you can re-send. While mountains in the line of satellite view or heavy tree canopy can temporarily obscure the GPS signal, I have only had my message fail to send on 2 occasions (out of several hundred); and I was able to re-send successfully a short while later. On the Spot website, I set up my Check-in/OK message to just say "I’m fine and just checking in”, and my Custom message says “I’m at a waypoint or camp” to let people know that I may be changing direction or stopping for a while. The cool thing with the messages is that you can create individual delivery lists (of text addresses or email) for each button, including the Help and SOS buttons. The message received at the other end also includes your GPS coordinates and a link to a map location on either the Spot website or Google Maps. My Check-in message just goes to my wife (and sometimes my kids), and I often set up my Custom message to also go to friends who are interested in tracking my progress. You can also set up a custom web page through Spot to post your GPS tracking positions, too. A nice feature to prevent inadvertent sending of Help or SOS messages is that these two buttons are protected by sliding removable covers so that you don’t press them by mistake. I have my Help message set to say “I’m not hurt badly, but please contact the nearest rangers” and it just goes to my wife and normally one backup. The SOS button will message whatever list that you set up but also the GEOS International Emergency Response Center, to send in the troopers; but that can come with a hefty price tag to pay for the rescue, so keep that cover in place unless you need it. Having the Spot with me makes my wife feel better, and I must say that sometimes it feels good to know that people could find me if needed. I also don’t worry so much if I change my intended route, because there will be a record of it. It doesn’t replace a map and compass or traditional GPS, because you cannot track yourself in real-time; but it keeps your loved ones content and provides some measure of safety. The other button on the device that we didn’t talk about is the footstep tracking button. This feature costs an additional fee beyond the $100/yr service charge; but it will then automatically send your coordinates to the Spot website database every 10 minutes, to record your path for future reference. This record is in addition to each time that you press a messaging button, so that after your trip you can review, map (and download) your GPS data. I haven’t used the tracking feature, but I have gotten into the habit of routinely using the massage buttons to record my progress for review. In addition to using it on backpacking trips, I have also had my daughters use it when studying abroad and traveling through Europe and Africa. I have found it so useful that I actually just bought a replacement after my one daughter ‘misplaced’ my original. Well worth the $127 price and annual service fee. I must say that Spot was also very helpful and fast in transferring my service from the lost device to the new device - very painless. Spot has released the Gen 3 Spot device, which is a bit smaller, lighter, and has better battery life (I’ve never had an issue with the Spot 2). It also has more options for the tracking feature, to adjust the frequency. This comes with a higher price tag and higher annual service fee. For me, I’ll stick with the Gen 2.